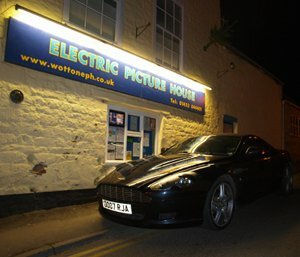 Skyfall, the latest in the James Bond franchise, had it's first night at Wotton under Edge's Electric Picture House on Friday 30th November. A sell out audience was surprised by the appearance of a gleaming black Aston Martin with the number plate O007 parked outside the cinema. Rumour had it that a man in a black tie and a dinner jacket had emerged from the car looking for a Q but the staff at the cinema said this may have been a misunderstanding. Skyfall continues at the cinema until Thursday 13th December.